You may not recall the name Bradley Birkenfeld. 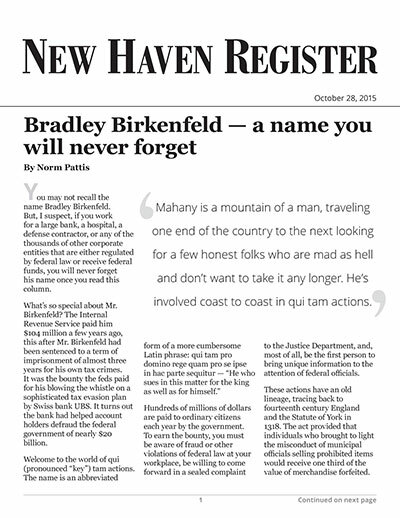 But, I suspect, if you work for a large bank, a hospital, a defense contractor, or any of the thousands of other corporate entities that are either regulated by federal law or receive federal funds, you will never forget his name once you read this column. What’s so special about Mr. Birkenfeld? The Internal Revenue Service paid him $104 million a few years ago, this after Mr. Birkenfeld had been sentenced to a term of imprisonment of almost three years for his own tax crimes. It was the bounty the feds paid for his blowing the whistle on a sophisticated tax evasion plan by Swiss bank UBS. It turns out the bank had helped account holders defraud the federal government of nearly $20 billion. Hundreds of millions of dollars are paid to ordinary citizens each year by the government. To earn the bounty, you must be aware of fraud or other violations of federal law at your workplace, be willing to come forward in a sealed complaint to the Justice Department, and, most of all, be the first person to bring unique information to the attention of federal officials. These actions have an old lineage, tracing back to fourteenth century England and the Statute of York in 1318. The act provided that individuals who brought to light the misconduct of municipal officials selling prohibited items would receive one third of the value of merchandise forfeited. Individuals were acting on behalf of the sovereign himself, enforcing a law the king was too busy adequately to police himself. Other acts targeting other misconduct were enacted elsewhere in England in the fourteenth century. I like a 1360 act permitting informers to sue jurors who accepted bribes. Although used in colonial times, these actions became more common in 1863, when Abraham Lincoln pressed for passage of what we now know as the False Claims Act. Lincoln targeted Civil War profiteers. The act has waxed and waned since then. A couple of weeks ago, a Milwaukee lawyer named Brian Mahany passed through town. He might just be the reigning king of qui tam actions in the United States. I took him for an early dinner at Modern Pizza in New Haven. Mahany is a mountain of a man, traveling one end of the country to the next looking for a few honest folks who are mad as hell and don’t want to take it any longer. He’s involved coast to coast in qui tam actions. “Why aren’t you bringing these claims?” he asked. It’s a question I’ve been asking myself ever since. It turns out they are no more complex than an ordinary white-collar criminal defense case. In fact, given the federal government’s reluctance to prosecute corporations deemed too big to fail, qui tam actions might just be the only chance ordinary folks have to make sure corporations obey the law. There are more than a dozen whistleblower acts, in addition to the False Claims Act. It seems that every time there is a scandal involving public safety or corporate malfeasance, Congress passes a new law permitting ordinary people to help the government enforce the law. Separate acts govern auto safety, airline safety, truck safety, mine safety, workplace safety, homeland security, the Internal Revenue Service, the Securities and Exchange Commission. Reading through these statutes is enough to make a lawyer feel like a kid in a candy shop. What if people fed up by corporate greed, corporate malfeasance and unaccountability, and the growing disparity between corporate plutocrats and the rest of us, what if people knew about these laws? “I’m in,” I told Mahany recently. He seemed happy to welcome me to the fray. He’s generous enough, and smart enough, to know there’s fraud a plenty in the corporate world: we the people are getting mugged more often than we care to admit. The trick in bringing many of these claims is to let the government do its work. A person bringing a claim under the False Claims Act, called a “relator,” must first file his or her complaint under seal — out of public view — in federal court. A copy of the lawsuit is served on the federal government, not the defendant. The suit is filed under seal so that the government can investigate the allegations. If the government accepts the suit, the relator can earn 10 to 30 percent of what the government recovers. Call it corporate bounty hunting. In the event the government elects not to press the claim, a relator can bring the action himself or herself in open court. Hundreds of millions of dollars are paid each year to relators as cash rewards for blowing the whistle. New England is home to defense contractors, to pharmaceutical companies and to major research institutions heavily dependent on federal funds and highly regulated. I suspect there are among us many individuals who don’t like what they see taking place at work: they may have reason to believe their employers are skirting the law, and getting away with it. The various qui tam actions provide employees protection against retaliation from vindictive employers. If you’re fired because you blow the whistle on your boss, your boss just might end up paying double and even triple damages. It asks a lot of ordinary people to bring an employer’s fraud to light. But in an era in which workers are expendable, and corporate loyalty is a quaint fairy tale, why, I wonder, aren’t more people willing to come forward to assure that corporations obey the law? If men were angels, we would not need government. The same can be said of corporations — if they were law-abiding, there’d be no qui tam actions. I’m looking forward to seeing false claims acts take root in Connecticut. I’m glad I shared that pizza with Mahany. Who said you can’t teach an old dog new tricks?